I’m not sure what is happening with Radiant Magazine (from Relevant), but I wrote this piece for their newsletter a couple of years ago. (I wish I could buy the whole magazine, actually, if they aren’t going to use it!) I was reminded of the piece this week after watching a documentary, Making Choices: The Dutch Resistance During World War II, with my Christian Classics class before we started reading Corrie ten Boom’s biography, The Hiding Place. This is probably one of my favorite books of all time – definitely one of my favorite stories. If there was ever a woman who defined the Rare Rocks title, it was Corrie ten Boom. Here is my article from 2007. Becoming a heroine of the Nazi resistance movement during World War II didnâ€™t happen in a single moment, but it started when Corrie ten Boom answered a knock at the door of her family home. Standing outside was a frightened Jewish woman with a suitcase asking for a safe place to spend the night. It would be dangerous to harbor an enemy of the powerful German presence in Holland in 1942, but the ten Boomâ€™s welcomed her saying, â€œIn this household, Godâ€™s people are always welcome.â€ Many others would find refuge there as well. By the time the German soldiers came and shut that door for the last time, Corrie and her underground network had saved the lives of nearly 800 Jewish men, women, and children. Corrie was sent to a Nazi prison camp as punishment for her involvement in the resistance. In the camp she suffered sickness, humiliation, and loneliness. Worst of all, she lost her sister Betsie, Corrieâ€™s constant companion before her death. After her unexpected (and miraculous) release, Corrie embarked on a speaking ministry sharing the lessons she had learned in the prison concerning love and forgiveness. She also opened homes for anyone wounded spiritually or physically by the atrocities of war, providing quiet places of healing and restoration. The author of several inspirational books and devotionals, Corrie writes with a simple, direct faith that challenges others toward both intimacy with Christ and action in the world. This simple faith mesmerized me as I read The Hiding Place, the story of Corrie ten Boomâ€™s life. I wondered if I could ever be so spiritual or so brave. I was suddenly aware of more than just my own small-town life but also the idea that a world existed beyond me that was full of unknown horrors and corresponding heroism. The story resonated in my soul. I was empowered. By following her example of devotion and neighborly service to others, I knew I could start making a difference in my own little corner of the world. Every morning and evening of Corrie ten Boomâ€™s life included a reading from Scripture and a time in prayer. This practice fostered an unfailing devotion in Corrie that was rewarded by the peace of God even under the worst circumstances. Surrounded by hate in the physical world of her Nazi prison, her spirit was free to grow closer to God. I am hungry for a relationship with the Word that creates the boldness Corrie had to smuggle the Bible into her prison knowing she could face severe punishment. Her risk paid off. That small Bible became the center of a nightly church service that ministered spiritual life to hundreds of women in the famous death camp of Ravensbruck. Besides learning to nurture a relationship with God, the ten Boom family also put feet to their faith by serving their community. Casper ten Boom, Corrieâ€™s father, was well known for his benevolence and hospitality even though the small profits of his watch shop could barely support the extra family members and foster children he gathered under his roof. As a young woman, Corrie followed his example and conducted church services for the mentally impaired in her neighborhood. Especially in the pre-dawn of Nazi elitism, these citizens were considered the untouchables of society. Corrie ten Boom was practicing social justice long before social justice was cool. Extending herself to the Jews was a natural response for a woman already devoting her life to what Jesus called the second most important commandment â€“ loving your neighbor. As inadequate as we may feel when measuring our lives against a renowned woman of faith, Corrie ten Boom would tell us that our own great adventures could be right around the corner. The opportunities to serve people in crisis are many; they range from neighborhood after-school programs to relief missions in Africa. We should start by shaping our spirituality with the Word of God, and the next step is easy. We simply wait until we hear a knock on the door, and then, like Corrie ten Boom, we answer in hospitable faith. Read more about Corrie ten Boom and see pictures of her famous Beje at www.corrietenboom.com. 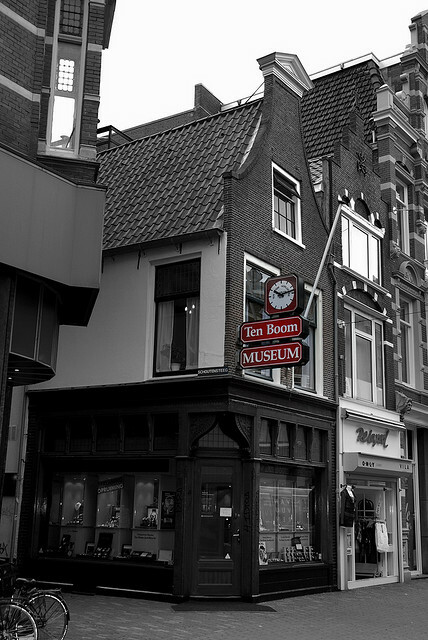 Special thanks to Andrew Page1 for this amazing shot of the ten Boom home in Haarlem. She really was a Rare Rock who knew how to stand on the One true Rock. What lessons her life teaches us – and your article clarifies it well! Hospitable faith. What a perfect description, and what a huge subject. Thanks for breaking it down with the challenge to just open the next door. Yea, where IS Radiant? The online version has said “undergoing a makeover” for months. This is a beautiful piece about a beautiful woman. We were trying to figure out how I’ve never read this book. I think it’s because I never liked being intimated by someone who rose to a challenge I didn’t ever want to face. I think I could read it now, though, and just be inspired to face my own – or more to the point, to care for others outside of the challenge it creates for me. Inadequate. That is EXACTLY how I feel, but you’re so right. We can all serve in ways both great and small. If you have time around 7 a.m. Friday . . .